These days there are many types of intelligent LEDs available. These LEDs flash or change their colour, slowly or quickly and with different colour combinations.Those LEDs that gradually change from colour to colour(so-called rainbow LEDs)were found to be particularly suitable for an alternative application. They happen to produce incredibly complex sounds when they are connected as shown in this circuit. Potential divider R1/P1 limits the current through the LEDs and has a significant impact on the sound produced. The value can be set between roughly 100 Ω and 100 kΩ. In this circuit it was achieved using a resistor and a preset. If you want to keep things very simple you can get rid of the preset and experiment a bit with series resistor R1. The circuit works with a single LED, but the addition of more LEDs leads to more interesting sounds because the LEDs end up ‘fight-ing’ each other for the energy. 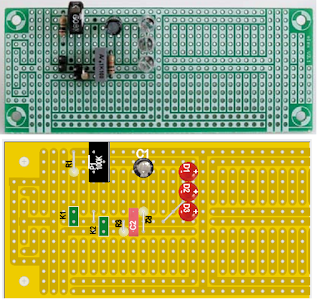 C2 and resistor R2 form a low-pass filter. Start with a value of about 10 nF in order to hear the full range of sounds. For a ‘heavier’ sound you can increase C2 to about 1 µF or even 10 µF. 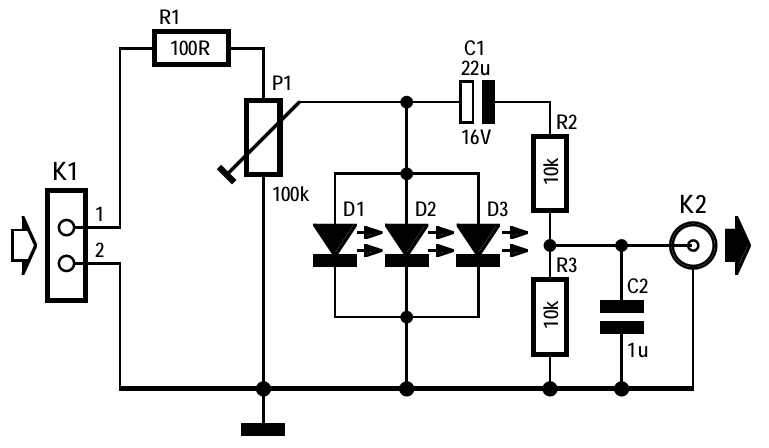 C1 avoids the presence of any DC voltage at the output. 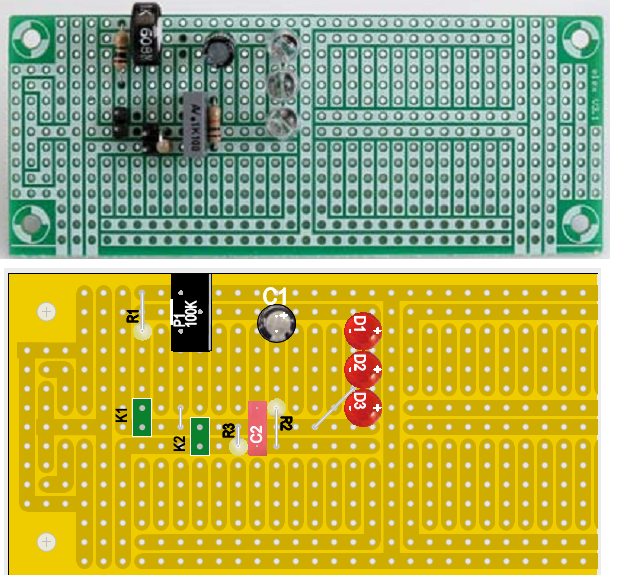 The supply voltage to the circuit can be anywhere be-tween about 4 V and 10V (depending on the value of R1 and the LEDs used). 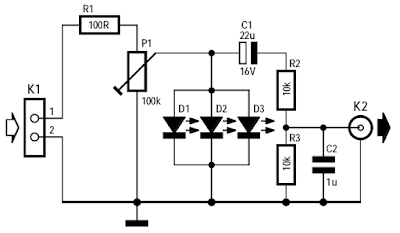 Make sure that you turn the volume down fully on your amplifier before you connect this circuit, since level of the output signal can vary significantly.